Preheat oven to 325 degrees F. Spray a large sheet pan with cooking spray. In a medium sized mixing bowl, sift together cake flour, baking powder and salt. In a large mixing bowl, whisk together 1/4 cup melted butter, ricotta cheese, egg, amaretto and vanilla until well combined; whisk in granulated sugar until combined. Stir flour mixture into wet ingredients until combined; stir in chocolate chips and pistachios until combined. Lightly knead dough together on a floured surface, form into a 10X4-inch log, and place on prepared sheet pan. Bake for 25 minutes or until set and slightly golden. Cool 10 minutes before transferring to a cutting board; slice very ends off, and diagonally slice log into 12 equal pieces (about 1/2-3/4-inch thick). Place slices onto sheet pan, cut side down, and bake an additional 20-25 minutes, or until slightly crisp; transfer to wire racks to cool completely. Melt the additional 1 tablespoon butter, and brush onto outer edge of biscotti; dip biscotti into confectioners' sugar to coat completely. 60 comments on "Cannoli Biscotti"
Man, I love cannoli. When I was a kid my dad would pick up some from this little bakery in the North End of Boston. They were the best. Those biscotti sound wicked good, I'm going to try them! Very clever idea; you mentioned so many tasty Italian foods...I'm so hungry reading this post, --even though I just ate dinner! My hubby and I didn't get to visit little Italy in NY, but we did check it out here in Boston--I'm noticing the comment before mine, I just might've visited that same place :). Great recipe. Oh, I want to go to NYC with you and eat until I can't anymore too. I love little Italy. In NJ, you can get cannoli anytimr you want. Thanks for sharing more shots. Reminds me to spend waaay more time in Little Italy when I get to NY again. We love biscotti, and I'm impressed by your flavor combination. Nice! you want to hear something shocking (that no italian american would want spread around too much?!) - they don't really make cannoli in italy. in some small towns in sicily, they do sell it at bakeries for breakfast. families will also sometimes make it at home, but it's not widely sold, and certainly not outside of southern italy. they generally call it cannoli cassata - it is stuffed with all the good stuff, and also all that gross dried fruit in fruit cake. it's kind of... not as good as american cannoli. i lived in italy for years, and never saw it in coffee shops, dessert stores or bakeries until i ventured down to sicily. i had one and it had so much candied orange flavor i had to put it back. ps - and look at you with your food network mug, ms tv star!! Thanks for opening my world - haven't had a green chai latte or a cannoli. I need to get out more. Hoping for snow tomorrow so I can bake something new! 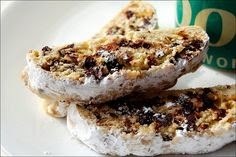 never had torrone, but LOVE cannoli :) i'll have to give these a try! Wow these sound so good! Yay, that you were able to experience so much that NYC has to offer. Your post makes me realize how lucky I was to grow up there. I too thought I should have been born Italian! And don't count Italy out - A girl can dream! Your pictures made me long for New York and I live here! I would love to see what kind of twist you could put on a canolli isnt there something you could mold them around? These sound great! I had cannoli flavored gelato not too long ago, it was delicious. Hot nuts?....LOL! Another great little treat you have worked your magic on Emily! Please make the zeppole! What beautiful photos! I didn't think biscotti could get any better, but you're on a continual quest to prove me wrong!! I always wished I was Italian when I was a little kid. While my friends were eating home cooked pasta, I had homemade lo mein. It just wasn't the same though I appreciate it now. I grew up Italian but it was many years before I tried a cannoli....have had Torrone before though-always at Christmas-YUMMY stuff! 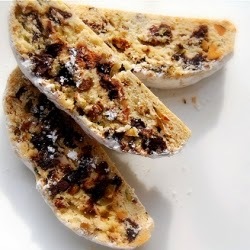 Your biscotti look SO good-what a great idea-cannoli in a biscotti!!! A must try for me. You are good girl, that biscotti sounds wonderful!! Wow, I love biscotti and would really give this a go....oh yes and also the cannoli's. Nice original idea, love that Cannoli Biscotti! I bet it's really good. emiline, i am obsessed with new york nuts!! please tell me you bought a bag. they rock. 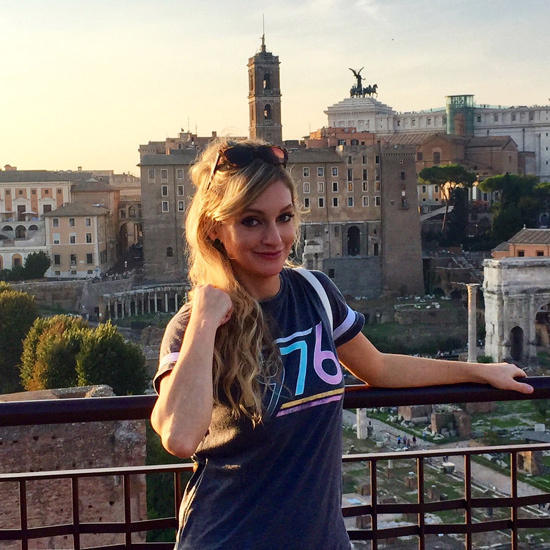 you kind of look like giada now that i think about it. your personality is way better though. she's a little too obnoxious for my taste and always has her cleavage spread out on our big screen tv. Wow! I can't believe you've been holding out from showing us those gorgeous pictures, especially the one of the cannoli. I love cannoli. Those biscotti are ingenious. How do you think of these things? Do they come to you in a dream? And don't say you'll never get to Italy. Why don't you try dreaming about it? You always make the coolest things. You're Italian in your heart, don't worry! Bob, I'm jealous. Is your new profile picture a cookie? Sophie, that would be ironic! Lisa, you can get cannoli anytime you want? Hmmm. I'm jealous again. Next time I go to NY, we're eating till we get sick. Heather, very interesting information you've provided. Thank you! Cam, that would be great. Maybe I'll win a trip or something. Doggy, that's what I was thinking. Something that could be fried. Joanna, don't worry, I don't have a lot of cleavage to spread out. Snooky, do what you want to do. yummy yummy! gosh that looks fantastic. love how you captured the taste of the cannoli in the biscotti. and don't you just love nyc? my sister lives there--she used to live right around the corner from little italy--we always have a blast together. I love the idea of cannoli biscotti! Two fabulous desserts in one, and no special equipment required :) San Gennaro is one of my favorite things to do in NY - I grew up going every year and still love it! When I went to Italy I pretended I was Italian..my name is Maria..ha! I fell in love with everything, especially the food!! Your biscotti looks so delicious!! Em - I hold you ARE Italian in some way. You know that cannoli is a plural and don't say "cannolis". Your mastery of the language is impressive. Your biscotti look very delicious. I haven't been to San Gennaro since I was in high school. I need to go back. Sausage and pepper wedges and cannoli and zeppoli - That's what life is all about! I sympathize with the Italy thing. I had really been hoping that I would go there this spring, but the economy has conspired against me. These days SPP is saying for our 10th anniversary. Well, that's 2.5 years away and anything could happen. Cannolis are my favorite part of little Italy. That along with the pasta, pizza, and close proximity to great shopping. Oh, and you are certainly not cooks champagne mademoiselle, oh no! haha! 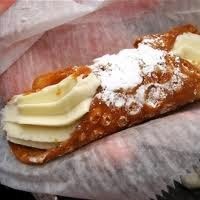 yep, we are fed cannoli out of the womb... red sauce not blood runs through our body... hehe!!! But i think everyone can be italian if they want! :) love the biscotti! yum yum! Very creative, Em...having a little Giada moment, are you? Love the street pics...and you will be in Italy. I said so. Ah! You're making me a little homesick with all of those pictures of Little Italy! San Gennaro is so much fun, isn't it? The food is more than incredible. Your biscotti look delicious too. Very creative! LOL you are so funny and adorable - oh dear, i don't even know what cannoli is. Cannoli's have always been my favorite ever since I was little. I would have never thought to put these flavors into a biscotti - so clever and delicious. Thanks for sharing! I love cannoli, and have made them several times throughout the years, but not recently... your cookies sound amazing and I must try them.... yum!! Those are some great photos, I never got sick of hearing about your trip. I had an inkling you were going to be on one of those shows. I had to laugh at your post because even though I'm 1/2 German and 1/2 Portuguese, I've always thought I was *really* an Italian through some sort of divine intervention, I guess. Ha! Wow, those photos brought back memories. I grew up on Long Island and always went to the Feast of San Gennaro. So much good food!!! Love cannoli's and your cannoll biscotti look great. The cookies look awesome. As you know I am a big fan of biscotti, so I will definately have to try this recipe! Don't be silly girl! Little Italy isn't the closest you'll get to Italy, I'm sure you'll get to go there sometime! What a cool idea to marry 2 great Italian classics! Their children look great! Brilliant twist on cannoli and biscotti...that's a winner! As for that Italian "candy", it's a nougat and Greeks make it too (mandolato). You're fine being "Just Emily". WOW there is nothing better than the food in the big apple.. My mouth is watering now!! Your recipe is incredible. Hi Emily, i'm very proud about your love of Italy, my country. Great idea your recipe. Brava! Cannoli are from Sicily, you know? Here the recipe is: ricotta (made with sheep's milk) and sugar mixed until smooth, almond and pistachio to add blend and color. I love this. What a great way to experience the cannoli with a little less work! I so want to learn to make Torrone too. Your Biscotti looks amazing. I LOVE cannoli but have never tried my hand at making my own either. I like the idea of the flavors being in a biscotti - I've bookmarked this to try soon. real italian biscotti does not use butter! What a great idea. I love cannolis but they are so heavy you definitely can't have them everyday but biscotti... well, you get the picture.